Almost everyone here at Oregon Outdoor Lighting was born and raised in the Pacific Northwest. This means we get it! We get that it is cold, wet and dark. All you want to do is button down the hatches, stay inside and forget about any outside projects. There are many days we would like to do the same. However, if you do this you will miss out on one of the best seasons to have outdoor lighting installed. 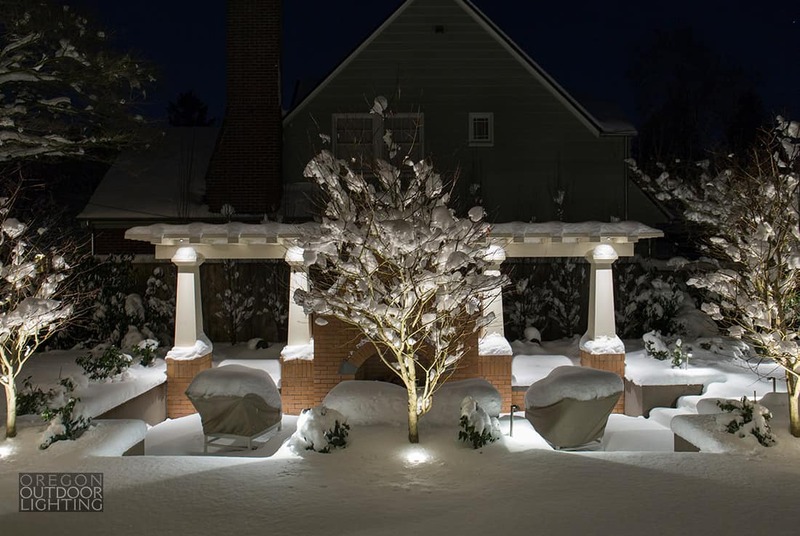 Below are our top 5 reasons why you should your outdoor lighting installed during the winter months. 1. Its Dark! With shorter days you spend more time awake when it is dark outside. A properly designed lighting system will allow you to enjoy your lights from inside and outside your home. This means you actually get more use out of your lights in the winter. You also just can’t beat driving home after a long day to a beautifully illuminated home. 2. Plants are dormant. With dormant plants and bare trees the installation of outdoor lighting can be a much smoother process. You also don’t have to worry about disturbing new pants. You can schedule a spring walkthroguh to ensure all lights are in proper focus once your plants return. 3. Avoid the Post Holiday Blues. Any Oregonian knows that the real stretch of winter comes after the holidays. Decorations and lights come down and we wait in the rain for a slow coming summer. Outdoor lighting can be the one piece that helps alleviate that heavy feeling from constant rain and darkness. 4. Focus 100% on your lighting project. Lighting can be installed year round. Projects like concrete and landscape can be much more weather dependent. By installing your lighting system while no other projects are going on it will allow you to allocate more time, energy and money towards getting the lighting system you deserve. 5. Be ready for summer. Summer is short enough as it is. By installing your lights in the winter you will be able to enjoy every minute of it instead of scrambling to get your outdoor lighting project done.